This meandering trail follows the course of Bunn’s Creek through a tight ravine. Framed with sloped embankments and shaded with a leafy canopy, the path is quiet and intimate. This is a natural parkway with wild or natural vegetation intact. It’s a popular spot with birders as song birds and waterfowl are plentiful. A variety of turtles call this home and northern pike, black bullheads, white sucker and many other fish use the creek for spawning in spring. 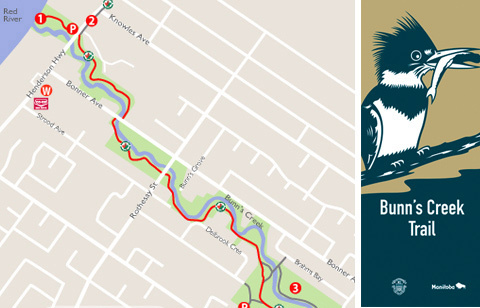 Mouth of Bunn’s Creek – A winding path takes you to forks of the Red River and Bunn’s Creek. As you look west across the Red River, you see McBeth Park and a stand of Plains cottonwood that are some of the oldest native trees still remaining in the city. Red River North Trail – This is part of the 110 km section of the Trans Canada Trail that travels north from Winnipeg to Lake Winnipeg and along the way passes through the towns of Birds Hill, Lockport, Selkirk, Beconia, Grand Marais and Grand Beach. Bunn’s Creek Centennial Park – contains a large sheltered picnic area with washrooms, and a family play area. In winter, the park has a popular toboggan slide and skating rink. Northeast Pioneers Greenway – This new 5.5 km asphalt trail, built on the former Marconi Spur rail line, is a popular recreation and transportation corridor. 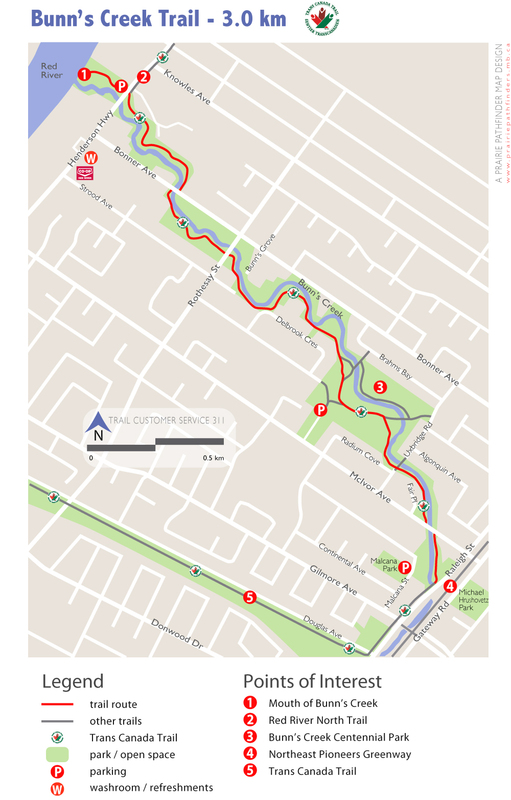 Trans Canada Trail – This section of Trans Canada Trail currently follows sidewalks and city streets. Plans are underway to install a multi-use pathway in 2012.